Sergeant Craig Apple has been a Deputy Sheriff for over the past ten years. 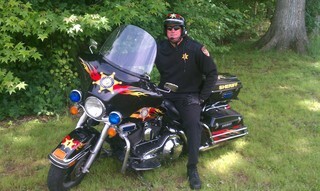 He has been with Guilford County Sheriff's Office since October 2005 and has been a motor officer for three years. Sgt. Apple also served eight years with Burlington Police Department and one year with the Gibsonville Police Department. Sgt. Apple started riding ATV's at an early age. He started riding street bikes ten years ago. When not working he enjoys riding his Harley Road King. His patrol issued bike is a fully equipped Harley Davidson Electra glide standard police edition. Being a motor officer has allowed him to improve in his cycling skills. Teaching Bike Safe is his way to help others learn different riding techniques.